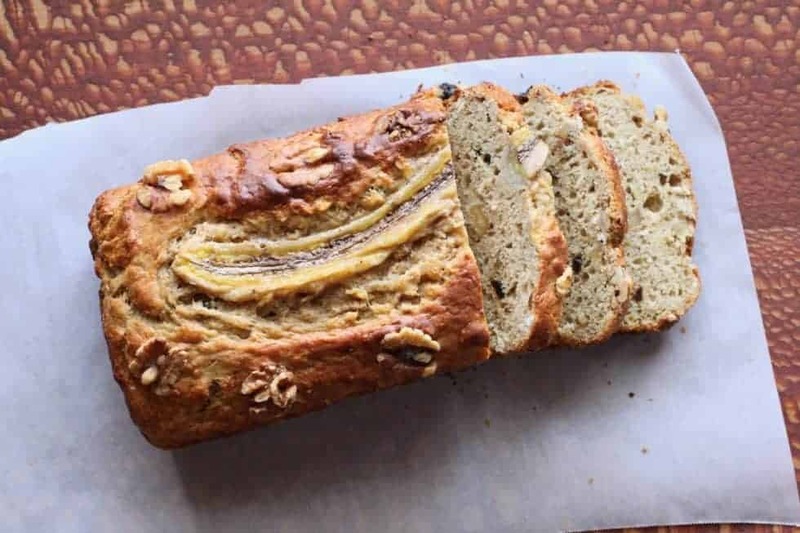 Banana Walnut Bread is healthier banana bread! Yogurt, whole grains, protein and fiber with less sugar and fat. 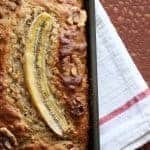 The best way to use ripe bananas! Lemon blossoms bring me to my family home in California. Pears take me to my grandma’s house. A whiff of espresso takes me to Italy. 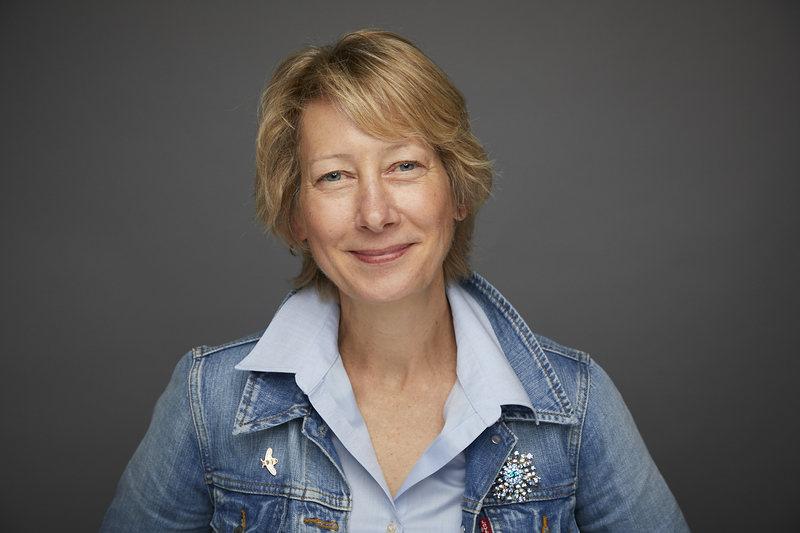 Our sense of smell has amazing power over memory and emotions. While oranges and other citrus may be stimulating and boost our mood, vanilla and lavender are more relaxing. Sometimes we need the soothing smells of simmered soup or baked bread. Cinnamon, bananas, walnuts and vanilla perfuming the house, feel like a hug. This month our challenge from The Recipe Redux was to bake bread. This week I wanted solace. So the timing was perf! I haven’t made banana bread in years. That’s not for a lack of overripe bananas, but because so many recipes seem more like a doughnut with all the sugar and oil. Not this LiveBest Banana Walnut Bread. Less sugar and fat. Many quick bread recipes have a cup of oil and 1 to 2 cups sugar. Not this LiveBest Banana Walnut Bread. Pumped up protein from eggs and yogurt. 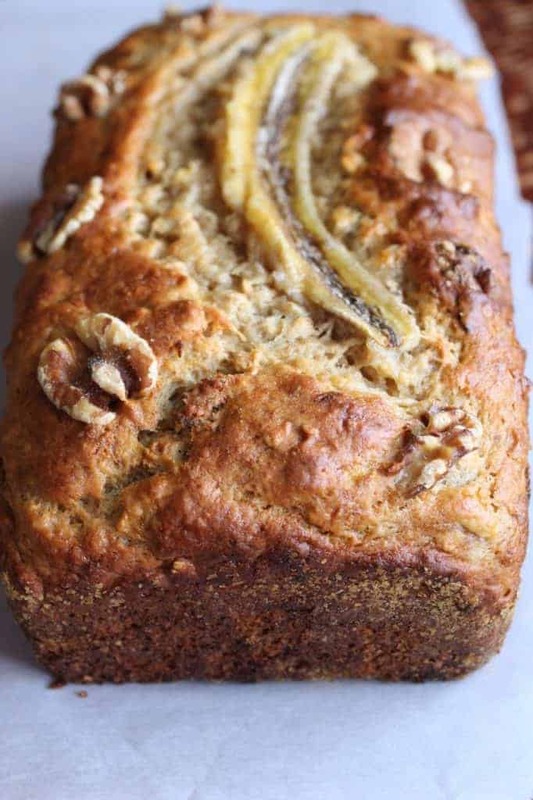 Fortified with fiber by the whole-wheat flour, oats, prune and walnuts. BTW: I created a free, 5-day challenge you can join by clicking this link. 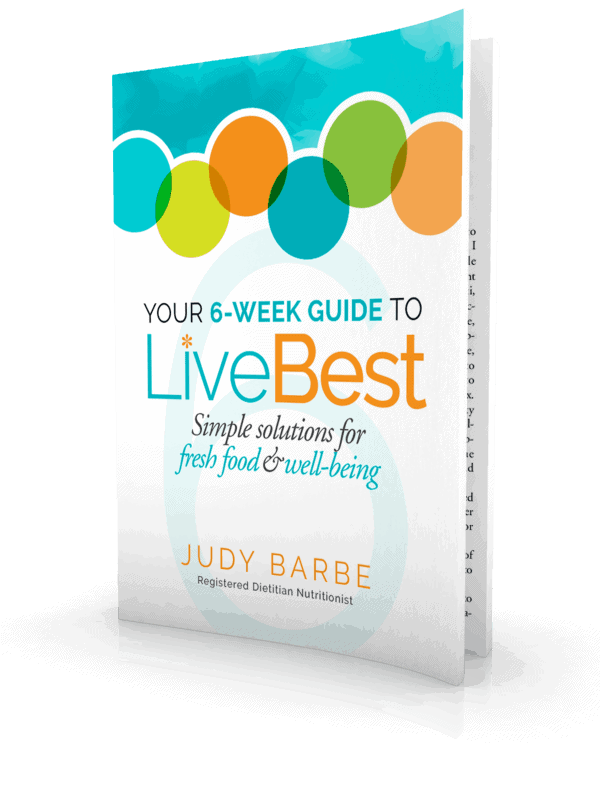 You’ll get tips and tools, resources and recipes to create your own roadmap to meet your fiber goals. Don’t ya? Won’t ya? Seriously, it’s only 5 days 😉 Find it right here. During banana bread taste testing, I asked Ken what could be improved. He said: If you’d made 2 loaves. Bananas prefer warm, tropical weather. If they get too cold, they refuse to ripen and sweeten. Bang them around and the bruises grow wider and deeper. Bananas store best at room temperature. The warmer it is, the faster they ripen. You can refrigerate them. The peel will turn black but the fruit is still good. Bananas can also be frozen. Peel them and store in an air-tight container. To ripen bananas, place them in a closed brown paper bag for a day or two. 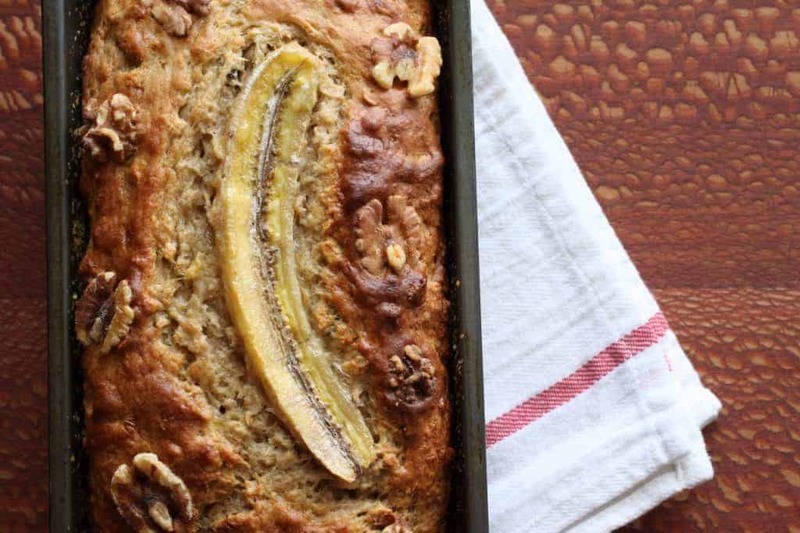 As they ripen, bananas become sweeter and more flavorful, so are good to use in other recipes. Mash and add to oatmeal while cooking. I use a potato masher. Slice and freeze. Whirl in food processor for sorbet. Blend a Berry Banana Smoothie. An aluminum pan is the most common pan on the market because of it’s ability to conduct heat. It does this very well, so it bakes a little faster and browns better. Stainless steel pans don’t conduct heat as well as aluminum. On the other hand, glass takes longer to heat and doesn’t conduct heat well, but it does hold heat for a longer time. That means with a glass pan the edges of baked goods may cook faster than the center, so you end up with dry bottom and sides. Reduce the heat by 25° F. to remedy this. 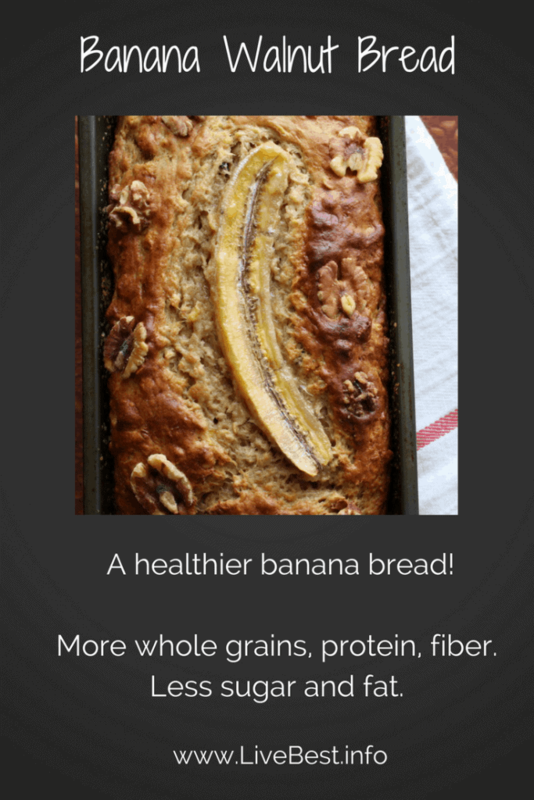 If you want to snazz up the loaf, slice a banana in half and set it on top of the loaf, cut-side up, before baking. Prep: Heat oven to 375° F. Spray a 9 x 5 loaf pan lightly with cooking spray. Mix: Combine bananas, eggs, yogurt, sugar, oil and vanilla. Beat on medium speed until well combined. Mix this: In a separate bowl, stir together the flours, oats, baking powder, cinnamon, salt, baking soda and nutmeg. Add to egg mixture and stir just to combine. Stir in walnuts and prunes. Bake: Pour into prepared pan. Bake 45-50 minutes or until a toothpick inserted in the center comes out clean. (No wet batter on the toothpick). Move to cooling rack and let rest 10 minutes before removing from pan. This post contains affiliate links. That means if you click on a link and make a purchase, I may make a small commission. This does not affect the price you pay.